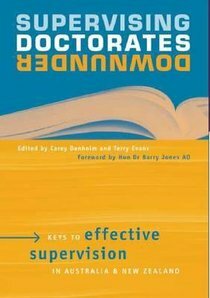 A comprehensive collection of essays designed to assist doctoral supervisors through candidate selection to thesis examination and post-doctoral life.Supervising Doctorates Downunder includes chapters on supervision-candidature agreements, ways to build effective supervision relationships, helping candidates write and think like a researcher, reviewing progress, oralpresentations, candidates health concerns, negotiating intellectual property, working with Indigenous candidates, part-time candidature and workplace research, and preparing a thesis for examination. - Publisher This comprehensive collection of essays is designed to assist doctoral supervisors through candidate selection to thesis examination post- doctoral life. It includes chapters on supervision-candidature agreements, ways to build effective supervision relationships, helping candidates write and think, and more. This comprehensive collection of essays is designed to assist doctoral supervisors through candidate selection to thesis examination post- doctoral life. It includes chapters on supervision-candidature agreements, ways to build effective supervision relationships, helping candidates write and think, and more.